The Brockwell Lido has been home and comfort to Rosemary since her childhood. Going for swims during WW2, meeting the love of her life George and making friends in the neighborhood has kept Rosemary going strong for nearly all 80+ years of her life. Paradise Living is an uppity high-rise building, paving over memories type of corporation that put in a bid to buy the Lido and turn it into a member’s-only gym for their tenants. 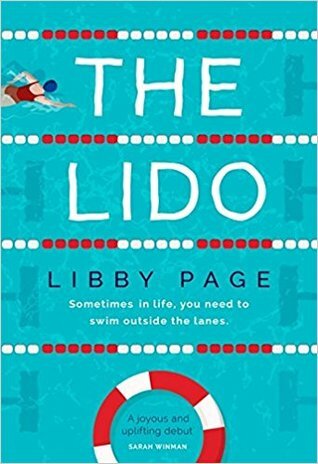 Now Rosemary has partnered with newcomer journalist Kate to try and save the Lido. This book is really a heartwarming and sweet story about friendship and perseverance. I wish I can be like Rosemary when I’m 87. She’s an amazing character, fragile and strong, smart and naive. Kate is also a great compliment to Rosemary. Kate is a bit more dull, but still a sweet, if not naive, character. All of the characters were kind of too good to be true. it would have been nice if someone from Paradise Living had made an appearance as a physical form of the conflict Rosemary and Kate are battling against. The story is pretty much one-sided with only Rosemary and Kate’s perspective on why and how the Lido should remain open. Then again, corporations like Paradise Living do quietly swoop in to purchase and delete the old standby’s of neighborhoods before anyone really notices that they’ve gone. This is a great “beach read” though, because all of the scenes with Kate and Rosemary had me wanting to jump into a pool and start doing laps.